Well established and highly-trusted operator. Superb software for Craps players. Good loyalty programs and giveaways. 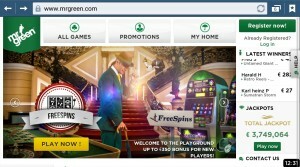 Mr. Green Casino was launched in 2008 as a casino site owned by Mr. Green Limited. The company is based in Malta; therefore it holds a gambling license issued by the Lotteries and Gaming Authority of Malta. I personally like Mr. Green Casino because it offers a refreshing casino experience. The site has very unique and well developed design, it offers wide range of popular games and it is an excellent option for those who like to play numerous blackjack games. Mr. Green Casino supports computers, laptops, smart phones and tablets; additionally, users can choose between various banking options and receive generous bonuses. As a passionate blackjack fan, I am always happy when I see more than one blackjack variant at online casinos. Therefore, I was satisfied with the blackjack offer at Mr. Green Casino, where I was able to play 11 different blackjack games. What I found at this awesome casino were some of the most popular blackjack variants from BetSoft, Net Entertainment, Evolution Gaming and IGT. Those who like BetSoft powered blackjack will enjoy American Blackjack, European Blackjack, Pirate 21 Blackjack, Single Deck Blackjack and 21 Burn Blackjack. All of these games work impeccably and have good graphics as well as good sound effects. NetEnt fans can choose between three blackjack games powered by this reputable company: Blackjack Professional Series, Double Exposure Blackjack and the all time favourite Blackjack Classic. IGT provided the Win-Win Blackjack, whereas Evolution Gaming is responsible for the amazing and authentic live blackjack tables like Blackjack Platinum and Blackjack. Being able to play games by leading software providers at one casino is always great and practical. I loved the 3D slots by BetSoft and the amazing titles from Microgaming as well as the entertaining NetEnt slots. For example, customers at Mr. Green Casino can play A Night In Paris (BetSoft), South Park (NetEnt), Star Strek (IGT), Tomb Raider (Microgaming) and many other top notch quality slot games by these well-known casino software providers. In addition, not only there was a wide selection of slots, but Mr. Green Casino also offers numerous table and card games. No matter whether I was in the mood for live dealers or playing alone against the system – I could play over 35 table games such as blackjack, roulette, craps, poker and baccarat. Of course, I wasn’t disappointed by the video poker category as well; Deuces Wild Jacks or Better and Joker Poker were only several games of the extensive video poker offer at this casino. Finally, Mr. Green Casino is not in shortage of instant win games too; keno, scratch cards and other arcade games can make users instant winners of valuable prizes. Mr. Green Casino caters to blackjack players, therefore, it offers special bonuses and promotions dedicated to blackjack fans. Additionally, from time to time, there are blackjack tournaments where players can win big prizes. For example, there was a Double Exposure Tournament open to those who had played at least 20 game sessions; the player with the best hand wins €1,000. Sounds attractive, right? I think that the 100% first deposit bonus is, more or less, standard offer that can be found at many other casinos. The minimum deposit amount that has to be deposited by players who want to receive this bonus is €10 and the maximum bonus amount is €100. Additionally, players get 50% second deposit bonus up to €50, 25% third deposit bonus up to €50 and 125% fourth deposit bonus up to €100. The wagering requirements are also similar to those of other casinos- 35 times the bonus amount. In addition, Mr. Green Casino regularly surprises its users by rewarding them with free spins for selected slots; however, the free spins are given to players via SMS or e-mail and therefore players should insert their contact information and regularly check whether they are the lucky winner of the day. 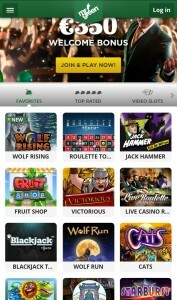 Mr. Green Casino also has a user-friendly mobile version of the site. Mr. Green Mobile Casino is optimised for tablets and smart phones that run on iOS 5.0 (or later) and Android 4.0 (or later). Naturally, the game selection at the mobile casino is not as extensive as that of the online casino. Nevertheless, I enjoyed playing on my Android device because the mobile site was working perfectly; it had the recognisable Mr. Green design, it was very user-friendly and the games worked perfectly. I really liked the Blackjack Touch powered by NetEnt Touch software. 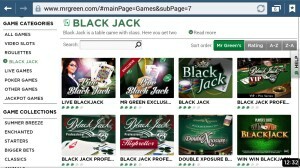 Additionally, since there is no need to download any software and the games are played instantly, Mr. Green Casino can be accessed by both Windows and Mac computers and laptops. Customers at Mr. Green Casino can choose between various payment options for making deposits and requesting withdrawals. When it comes to funding my account, I was able to use bank transfer, ClickandBuy, Maestro, MasterCard, Neteller, PayPal, Paysafecard, Skrill, FundSend and Visa. The minimum deposit amount varies from €1 to €10, depending on the preferred payment method. Mr. Green Casino has reasonable minimum withdrawal amount of €30 and it usually takes 1-7 business days for players to withdraw their money. The accepted withdrawal methods at Mr. Green Casino are bank transfer, ClickandBuy, MasterCard, Skrill, PayPal and Visa. The maximum withdrawal amount per withdrawal and per month is €10,000. In my opinion, Mr. Green Casino is one of the best online casinos on the market. This casino has everything regular and high roller blackjack players need. It has unique and recognisable design, it has good bonus offers and regular promotions and over 10 blackjack variants run automatically or by live dealers. Furthermore, the games can be also played on tablets as well as on smart phones. To sum up, the fun at Mr. Green Casino never ends! That is why I would gladly recommend this casino to anyone who would appreciates high quality games and entertaining gaming atmosphere. Well establish and trusted operator. Great software and smooth gameplay for Craps. Good loyalty program and social media giveaways.